Maintaining your cognitive health never tasted so good. 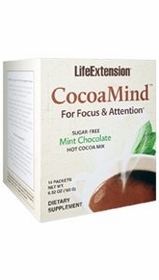 CocoaMind™ is an irresistible hot-drink mix that delivers a fast-acting boost for mental focus and concentration. Because as it turns out, cocoa and spearmint actually promote healthy attention and working memory — in addition to being delicious. Mix with hot water, milk, or coffee for a brain-boosting pick me up. Other ingredients: guar gum, maltodextrin, sunflower oil powder, stevia extract, natural peppermint flavor, rice starch, modified food starch, thaumatin. Non-GMO Neumentix™ is a trademark of Kemin Industries, Inc. Each serving contains approximately 19 mg of caffeine (the amount found in about 1/2 cup brewed green tea). Directions •	Gradually mix one (1) packet into 8 oz. of hot liquid (to taste) and stir thoroughly. •	Because this product contains natural cocoa powder, some clumping can be expected during mixing. •	Use one (1) packet daily as needed, with or without food, or as recommended by a healthcare practitioner.